Since the start of 2015 we’ve drawn attention to the pattern of record-setting sales despite far fewer homes being on the market than usual. 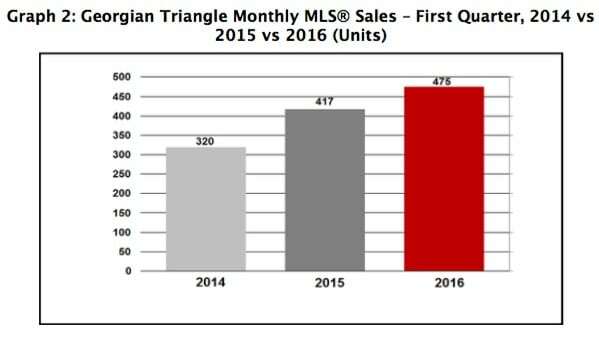 Well, those record sales continued through the first quarter (Q1) of 2016, many involving multiple offers. However, in March the number of homes which came on the market was actually up over March 2015 – the first time since December 2014 that the number of new listings exceeded the same month of the prior year. So are we looking at a single wave or the beginning of a sea change? Time will tell . 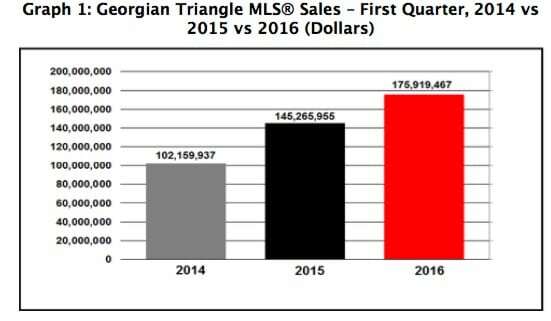 . .
Q1’s sales volume of $175,919,467 is up 21.1% over 2015’s previous Q1 record, and up a big 72.7% over 2014. And as Graph 2 shows (see the next page), 2016’s unit sales of 475 are up 13.9% over 2015’s Q1 record, and up 48.4% over 2014. Moreover, this year’s sales came despite there being 8.5% fewer new listings on the market than Q1 of 2015, and 18.8% fewer than Q1 of 2014. NOTE: All MLS®sales data in this report comes from the Southern Georgian Bay Association Of REALTORS® and the REALTORS® Association of Grey Bruce Owen Sound. We’ll address March’s increase in new listings over last March in the next section. But for now, the bottom line – especially given all the multiple o er situations we’re seeing this year – is that the demand for listings still greatly exceeds the supply in the Georgian Triangle as a whole. As Table 1 shows (see below), 2016’s record pace is reflected in nearly all of March’s sales performance details. The month’s volume sales of $70,206,824 are up 9.9% from 2015’s previous March record, while unit sales of 188 tied last year’s record. With regard to unit sales activity in the various price ranges, 2016 is either up significantly or equal to 2015 in all ranges except $100K-$299K (down by 1 sale) and less-than-$100K (down 4 sales, mainly due to fewer homes listed). On the plus side, 2016 has enjoyed big gains in the $300K-$499K, $500K-$799K and $1.5M+ ranges (up 42.5%, 18.9% and 100% respectively), while sales of homes over $300K are up 34.1% overall. 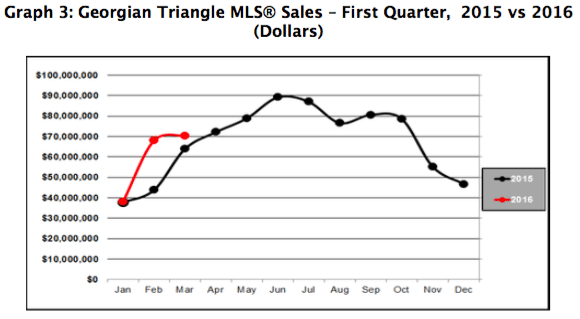 Lastly, Q1’s average sale price of $370,357 is up 6.3% from a year ago. And now, regarding the new listings increase – as Table 1 shows, 429 listings came on market in March, a slight rise from last March’s 423. Not only that, but this March’s expired listings are down 37.1% from last March, and Q1’s expired listings are down 41.9% from Q1 of last year. While the combination of more new listings and far fewer expired listings might suggest that many more homes are now on the market – resulting in increased competition among sellers – that’s not the case. 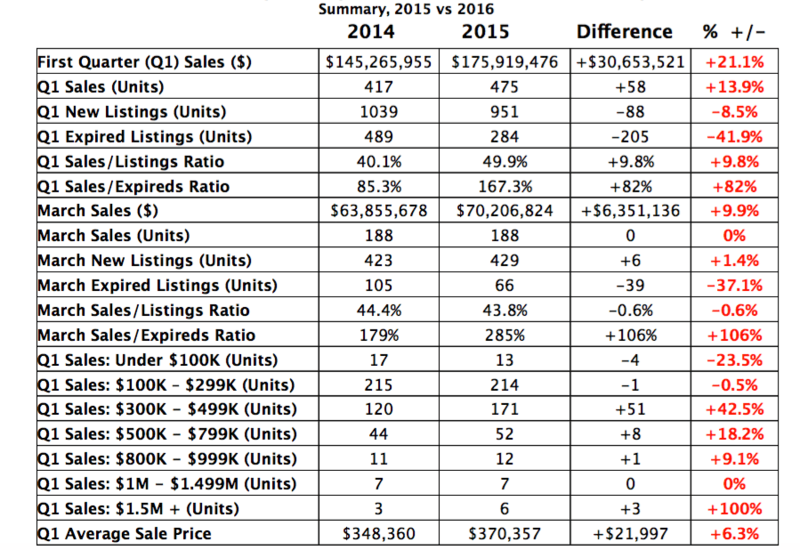 Q1-2016’s big reduction in expired listings is more due to the fact that from September 2015 to February 2016 sales were up 17.6% and average monthly listings were down 21.2% from September 2014 to February 2015. Or in short, expired listings were way down in Q1-2016 because in the months leading up to it far more homes sold and far fewer homes were on the market in the first place. And so, there were far fewer listings to expire. 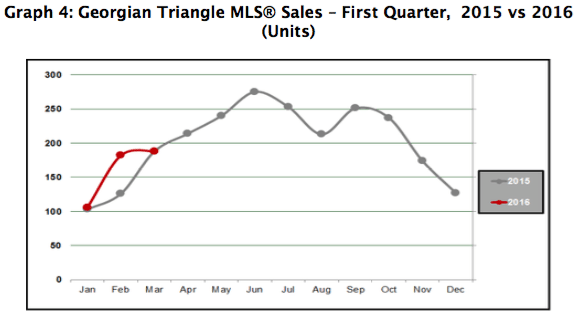 Looking now at Graphs 3 and 4, we see that after February’s spike in sales volume and units over last year, March’s sales leveled o comparatively, although they’re still monthly records. Q1’s market metrics generally translate into the details of Single-Family Home Sales (Graph 5) and Sales by Property Type (Graph 6). 2016’s single-family homes sales are up 14.5% from last year. The gains are mainly due to high-volume Wasaga Beach’s 37.3% increase, as well as to Clearview’s surprise doubling of its 2015 sales. Collingwood is also up slightly, while Grey Highlands, The Blue Mts. and Meaford are down 2.1%, 3.9% and 22.5% respectively so far this year. 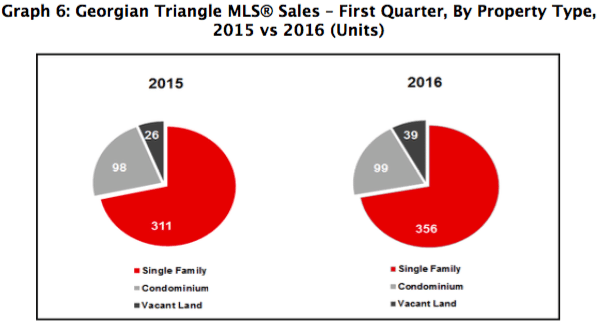 Lastly, 2016’s condo sales are up 1% from 2015, while vacant land sales are up 50%. With the exception of March’s slight increase in new listings over last March, the first quarter of 2016 was, well . . . rather ho-hum, record-breaking business as usual. But seriously folks, we’ve been on an incredible run here in the beautiful Georgian Triangle for two years – in fact, March was our 24th consecutive record sales month. And according to industry watchers, there is no obvious reason, short of something macroeconomic, why our regional market should not continue to perform well for some time. Even March’s increase of new listings – far from signaling a possible shift away from the hot sellers’ market by increasing supply and reducing demand – is being welcomed by all our Locations North agents who said throughout 2015 that sales would’ve been higher if there’d been more homes on the market. 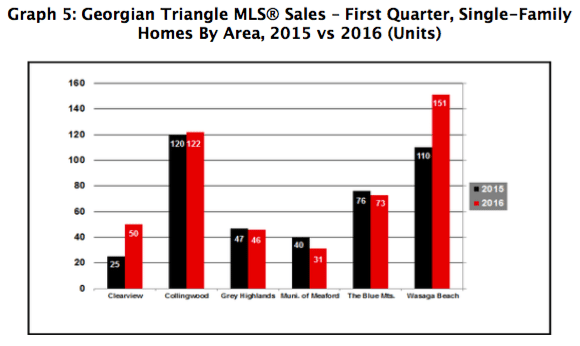 As to whether 2016’s record sales will be sustained throughout the year as more and more people discover and take advantage of the Georgian Triangle’s four-season lifestyle and great value, only time will tell. Please stay tuned as we regularly provide our Georgian Triangle Market Reports in order to help you make better-informed, real estate decisions.